Welcome to Summit Miniature Pinschers. We are located in Calgary, Alberta, Canada, at the Foothills of the Rocky Mountains. My name is Kathy. My husband Bernd, son Jeffrey and I are collectively owned by a small and entertaining crew of Miniature Pinschers. We were captivated by the spirit and presence of these 'big dogs in a small package' after first seeing them at a local dog show. From our first pet Min Pin, our merry group has grown to include our Champions, and the fun at our house has multiplied accordingly! Our dogs are registered with the Canadian Kennel Club, and most are also registered with the American Kennel Club. 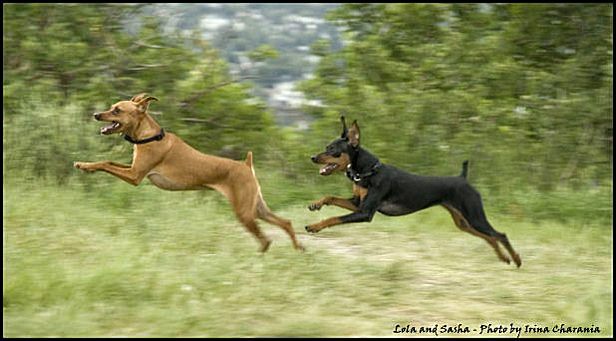 I show my dogs in CKC (Canada) and AKC conformation, and train them in obedience. 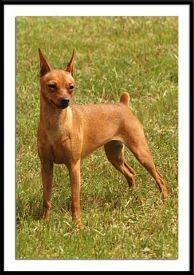 I am a member of the Canadian Kennel Club, Miniature Pinscher Club of America (MPCA) and the Southern Alberta Toy Dog Fanciers. I have small scale, home-based breeding program. Puppies are available occasionally for show homes or as loving companions. My goal as a breeder is to retain the qualities of the Breed Standard and continue to build on the soundness, health, temperament and movement established by the foundation lines that I have started with. I am gratefully indebted to Christine Smith at Aztex Miniature Pinschers for her wisdom and guidance establishing my foundation line. Whether you are looking for a Min Pin to call your own, or just have a general question about the breed, I invite your inquiries. * All dogs titled as CH in the pedigrees are American AKC Champions unless otherwise indicated.